Before the Empowered player who is closest to Aksis stuns him, one of the other two Empowered players can discharge their Empowerment into the glowing red square. This gives every team member their super. For every teleport, there will be one Empowered player on the left, on the right, and in the middle. Even if Aksis is already on a certain side, there should still be a player positioned on that side because they have to cover the Supercharge square when Aksis moves. There is a way to set a team up that covers every teleport and Supercharge combination. The left Empowered player will stand on the yellow square in front of the left pillar. The right player will stand on the yellow square in front of the right pillar. The middle player will stand halfway up the right side’s stairs. When Aksis teleports right, the right Empowered guardian will slam Aksis. The middle player will discharge Empowerment on the middle square if open. The left player will discharge left if the square is open. When Aksis teleports inside, the right Empowered guardian still slams Aksis. The middle player will discharge right this time, if the square is open. The left player still discharges left if the square is open. When Aksis teleports outside, the middle Empowered player will slam Aksis. The right player will discharge into the right square if it’s available. The left player will discharge the left square if it’s available. When Aksis teleports left, the left Empowered player will slam Aksis. The middle player will discharge middle if possible. The right player will discharge right if possible. There is a pattern in the scenarios that were covered. There is never a guardian covering a discharge square in the same area that Aksis teleports to. This is because the square that opens up for discharge is never on the same side that Aksis teleports to. Further, even if Aksis goes inside, that still counts as middle, so the outside square won’t be available. This supports the rationale for why the middle Empowered player covers the right square when Aksis teleports inside. There were a lot of scenarios that were just discussed, so feel free to look at the chart below that summarizes the actions each Empowered player should take for each combination. A player can get a bit of a jump on where they need to go by having a non-Empowered player stand on the platform on the middle of the stairs in front of Aksis. As Aksis prepares to teleport, there are SIVA swirls that stick out of one of his sides. These indicate the direction he is teleporting. If the player on the center platform calls this out, the Empowered player can start making their way to where Aksis will land, and the other Empowered players can think about and react to what square they are supposed to cover. For example, if a player calls out that Aksis is going right, the right Empowered player can start making their way to the right teleport. At the same time, the left player can move to the left square and the middle player can move to the middle square in anticipation of activating the Supercharge. Most Empowered players slam Aksis as fast as possible. When he teleports to a player’s side, their heart rate increases. The team is relying on them to slam Aksis and keep things going. It’s all on that player at that specific moment, so they frantically slam him immediately to complete their task. With this added mechanic, a player cannot slam Aksis until one of their teammates has Supercharged the team. When Aksis is slammed, the discharge squares are closed, meaning the discharge has to be activated first. There is a system to make sure the Supercharge and the slam can both be achieved. When a player is roughly 2-3 meters from their open square, they can say “Supercharge”. The guardian that is supposed to slam Aksis should be ready to stun him by the time they hear that callout. By the time the first player activates the Supercharge, the other player will be right on top of Aksis and slamming him almost simultaneously. As the player slamming Aksis, hovering over him until the callout is heard is a good strategy. This player can then press the appropriate button to stun Aksis once the callout is heard. When first trying to get the Supercharge mechanic to work, it will be very stressful. On a personal note, I’ve had players drop out because it was too much to deal with. Be prepared to get frustrated and be prepared to fail. There are a lot of things to worry about. A player is using their super 3-4 times each rotation. This is more difficult to accomplish if they’re Empowered because they have to get to their position. They may also be focused on getting the Weapons of Light buff if there is a Defender Titan on the fire team. Lastly, they’re also trying to remember how their job changes depending on where Aksis teleports. It might seem to make sense when reading about it, but like anything, it gets overwhelming in the heat of the moment. The reason for bringing this up is, the last thing a player wants to be spending time on is debating which Empowered players go where, because of how much information is already on their mind. There is a way to efficiently determine who goes where, which makes the Empowerment discussion less of a hassle. On most teams, there are two people in each area (left, right, and middle), one of which is a Cannon user and one of which throws the SIVA bombs at Aksis. The SIVA throwers are the Alphas and the Cannon users are the Bravos. Alphas take priority for Empowerment in their area. If a Bravo player and an Alpha player are both Empowered on the right side, it is the Bravo player’s responsibility to move and cover the open side. This makes sense because the Cannon users (Bravo) move around to shoot their Servitor, so they’re already on the move. Whereas the Alphas are the SIVA throwers, and since they always stay put to throw their bomb, they get priority in their respective area. As soon as Empowerment is obtained, players should call out their status and location. For example, a Cannon user on the right would say “Bravo Right” if they’re Empowered. If they don’t hear “Alpha Right”, they will cover the right side. If they do hear “Alpha Right”, their partner takes priority and they need to go elsewhere. In that case, if they heard the third player call middle, they know left is open. If the third player called left, they know middle is open. It is critically important that non-Empowered players stay quiet at this time. By discharging Empowerment into an open square before another Empowered player slams Aksis, a team’s supers are charged. No matter where Aksis is, there should be one player left, middle, and right. The discharge square that opens up is never on the same side that Aksis teleports to. 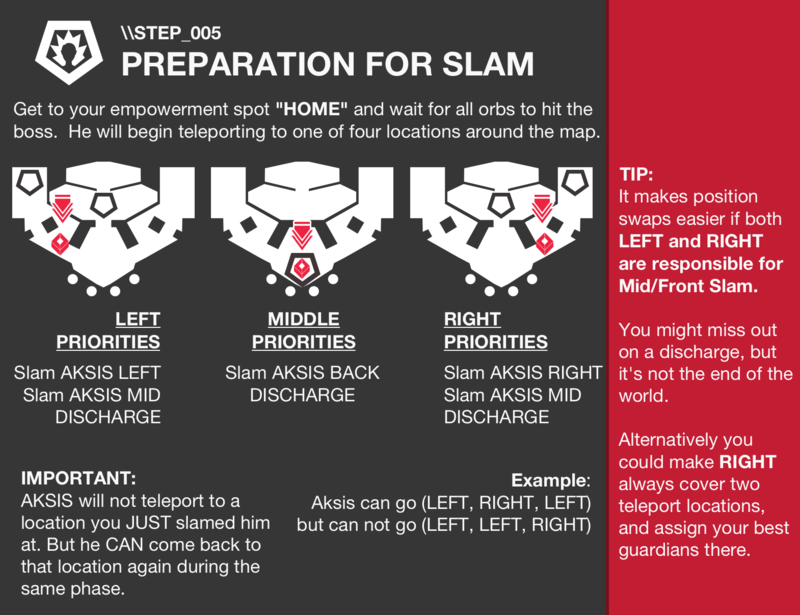 Empowered players can get the jump on where they should be going if a non-Empowered player calls out where Aksis is teleporting. 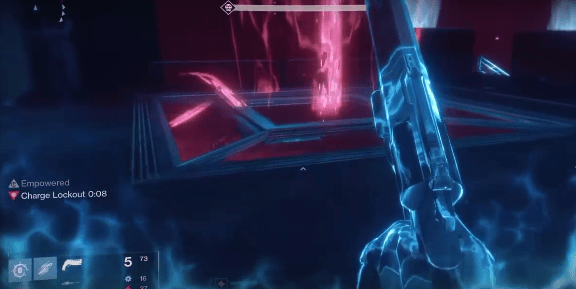 Look at where his SIVA particles are pointing the moment before he teleports. The player who is slamming Aksis should wait on one of their Empowered teammates to call out their Supercharge, but not too long that the window to dunk Aksis is missed. Adopting the Alpha/Bravo system will reduce the hassle of determining which Empowered players go to which positions.